I’m sitting on a bench beneath the shade of a determined sugar maple tree, perhaps its verdant growth encouraged by the view I’m enjoying. Who or what wouldn’t be heartened with these delightful surroundings. Youngsters set sail on skiffs, their teenage teachers guiding them into and out of the steady east wind, tacking, and turning this way and that, the multi-colored sails energized by the steady lake breeze. Only weeks ago a much different scene played out in this same location. One nor’easter after the other pounded the shoreline that now houses a single-file line of dinghies slotted between wooden four by fours. The shoreline lost, as it always does, against such strong forces of nature. So did the dock, which had its securely anchored metal benches washed overboard. Today, however, is different. The lake breeze is just stiff enough to keep Old Glory and the nautical signals continually flapping and a lone great egret working overtime to a new upwind fishing spot. Beyond the pier’s end, a cigarette boat slices with ease through the small waves of Lake Erie. Sun worshippers, fisher-people, and swimmers all bask in the sun-drenched day, thankful the oppressive heat and humidity of recent days have been replaced by these ideal conditions. Not a single contrail pollutes the all-blue sky. Purple Martins and tree swallows also sail over all the human aquatic action, skimming the latest hatch of Mayflies from the air. Parents and proud grandparents stand along the shoreline or in the pavilion watching their sons and daughters and grandsons and granddaughters sail away on the blue-green water chop. In a matter of minutes, they safely return, smiles replacing any lingering fear of their maiden voyage. Just off of the end of the reinforced breaker wall of native limestone, fishermen bob in their bass boat, casting and recasting without success. They soon move on to calmer and hopefully more productive waters. 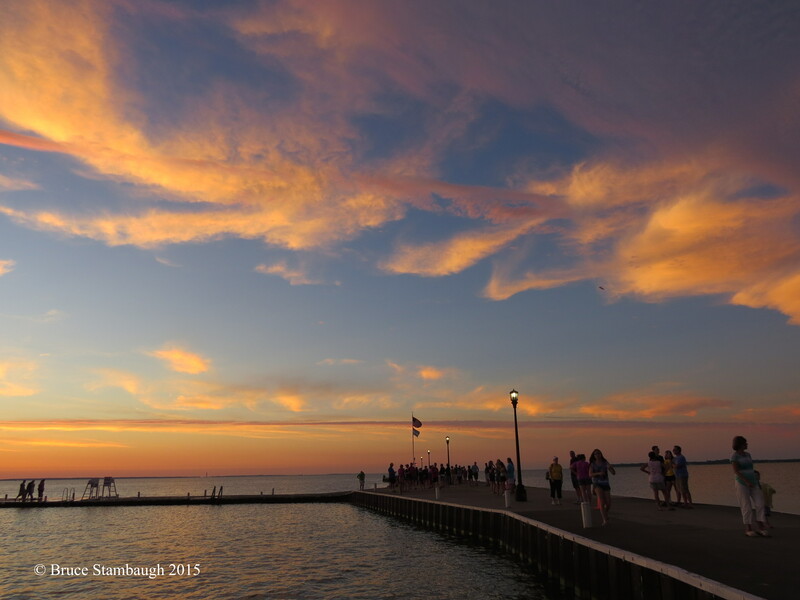 Back on shore, walkers stroll the sidewalk that runs the full length of the shoreline that makes Lakeside lakeside. 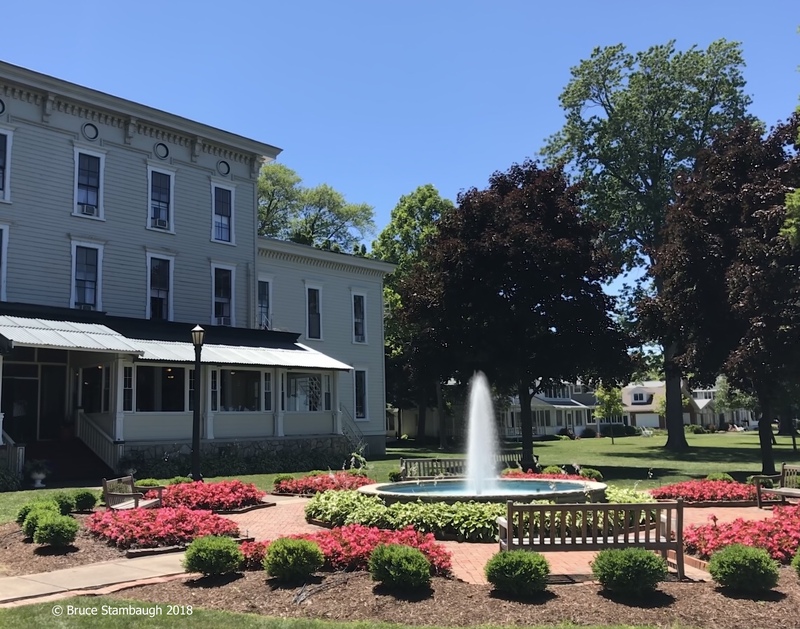 This Ohio resort town, appropriately known as the Chautauqua on Lake Erie, is bustling with activity on this Sunday afternoon. Lifetime Lakesiders gather on other shaded wooden benches like they have for decades like their parents and grandparents did before them. Only the seats are different. The view, the busyness of recreation, education, arts and crafts, and entertainment of the friendly, gated community unfold all around them just as it did when they were children, too. Bicycles and golf carts wait patiently for their drivers and passengers in the green grass along the blacktop’s edge. The bikes stand unlocked, and ignition keys dangle freely in the carts. Such is Lakeside. Daring teenage girls try their hand and legs at paddle boards, nimbly dropping to their knees when their hesitation takes hold. They eventually regain their confidence and return to their paddling. The Westminster chimes of the clock tower atop the nearby pavilion bong 3 p.m., followed by bells singing “How Great Though Art.” Behind me, a gurgling fountain lures a toddler away from her mother until she beckons her daughter to the spotting scope aimed at Perry’s Monument on Put-in-Bay. These few minutes spent observing, absorbing, listening, looking, appreciating all that is Lakeside, Ohio renews my body, mind, and spirit. Given this setting, that’s what is supposed to happen. You don’t have to be at Lakeside to garner these healthy, in-the-moment results. But it sure helps. There’s never a dull moment at Lakeside, Ohio. That’s quite a statement for a sleepy, little village on the shores of Lake Erie. Don’t misunderstand. That doesn’t mean the residents are rowdy. Just the opposite is true for this Chautauqua town. In the summertime, Lakeside bursts with energy and activities, planned and spontaneous. There’s never a dull moment because there’s just so much to do for any and every age level. I’ll let the activities speak for themselves. The Lakeside programming offers vacationers and residents a multitude of sponsored options that enrich the body, mind, and soul. 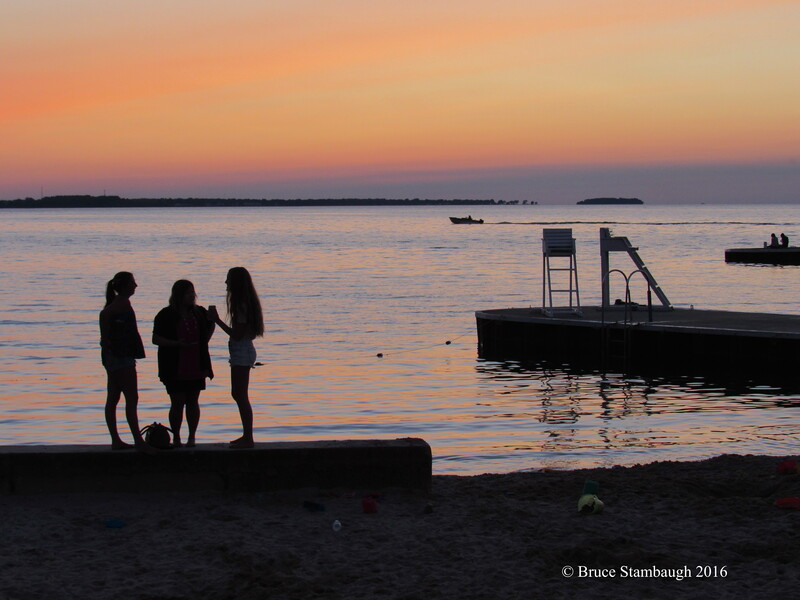 Founded in 1873 as a Methodist Church camp, Lakeside has evolved into a summer destination for thousands of folks across the country. Shuffleboard, a favorite Lakeside pasttime. Lakeside is a place that welcomes all who come to relax, learn, meet new folks, enjoy entertainment, and commune with others and nature. It’s why we keep going back year after year. Now that we’ve moved to Virginia, my wife and I make Lakeside our guaranteed summer vacation. Since Lakeside is a gated community during the summer season, it’s a safe place to be for one and all. Kids are free to roam its crisscrossed streets that run the mile length of the cottage-filled community. They won’t be alone. The community swells to 6,000 or more residents at summer’s peak. Making new friends is easy. Besides, the 300 year-round residents are glad to have the company. Planned programs and classes for toddlers to teens to senior citizens fill each day. Choosing which activities and events to participate in creates an estimable problem. You won’t hear “I’m bored” at Lakeside. Children can attend arts and crafts classes, build model boats, or enjoy a game of shuffleboard with family and friends. Lectures, bible studies, morning worship, and walking tours enlighten the adults. For those who love the water, Lakeside offers swimming in its new pool that includes lap lanes, a kid’s area, and water slide. There’s even a children’s splash park down by the dock. The waterfront is really where the action is at Lakeside. 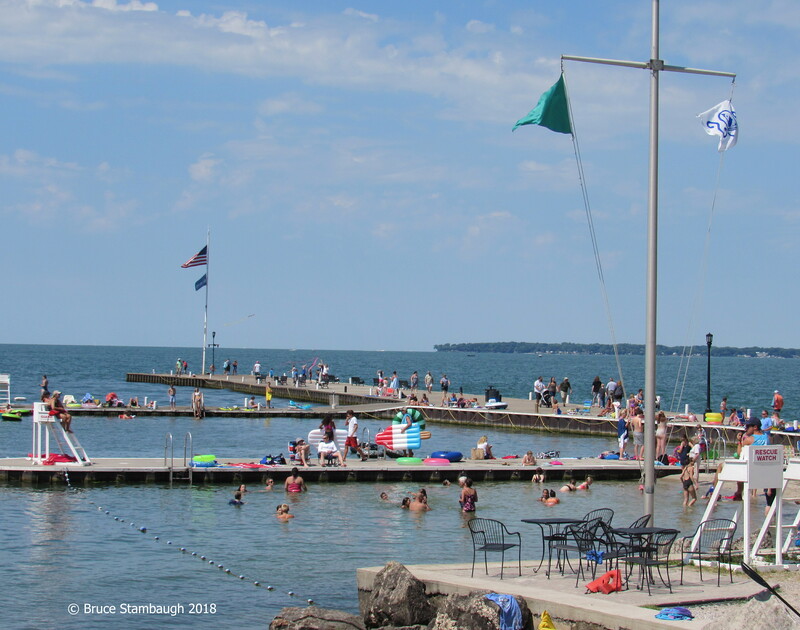 The dock is the go-to place for sunbathers and fisherpersons alike. Lifeguards standby for those who choose to swim in the lake. Sailors young and old navigate their own boats. You can fill your day with more casual options, too. 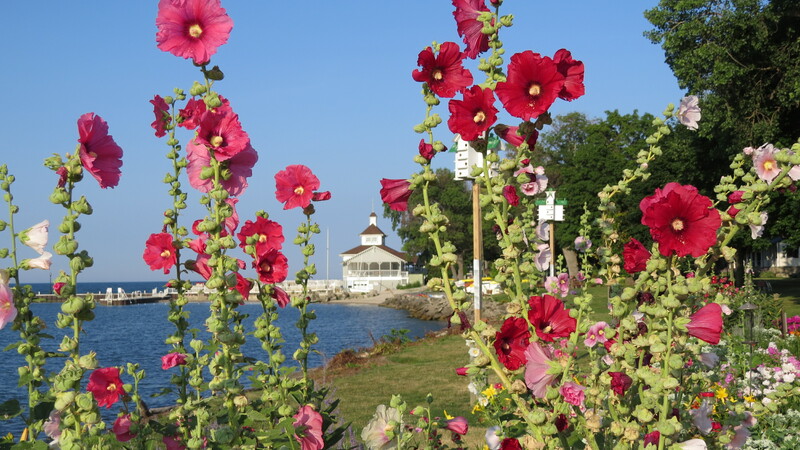 Take a leisurely walk along the shore while enjoying beautiful flower gardens, lovely cottages, and gorgeous views of Kelley’s Island, and Perry’s Monument at Put-in-Bay. Or sit on a park bench beneath giant shade trees and dream the day away. In the evening, Hoover Auditorium takes center stage with a variety of programs that captivate the entire family. Admission costs are included in the gate fees. If the weather cooperates, sunsets draw people to the dock for picturesque photo ops. 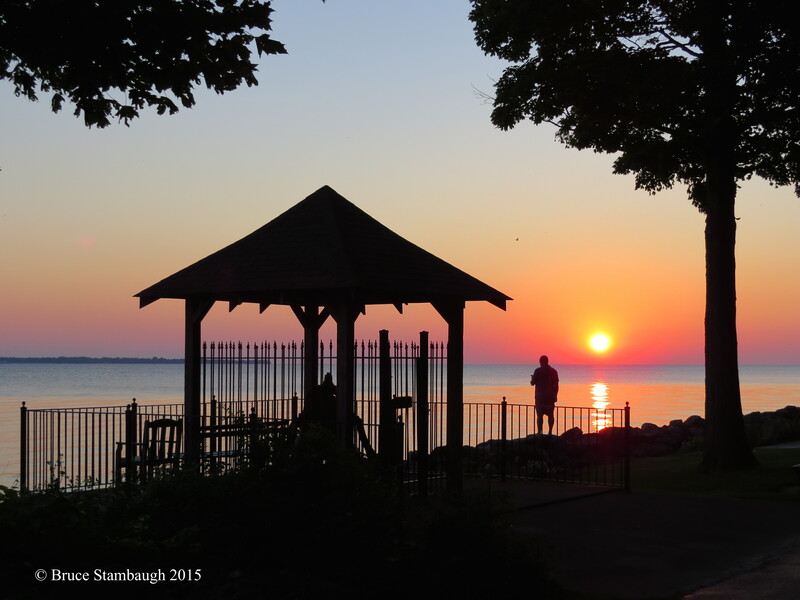 Sunrises are just as spectacular rising over the lake with their pinks and blues. A farmers market offers up local produce and delicious homemade goodies two mornings a week. For those less worried about their diet, freshly made donuts and hand-dipped ice cream bring many smiles. As for my wife and me, we’re more than content to sit on our favorite sweeping front porch that dominates the front side of the guesthouse where we stay. At the corner of Third and Walnut, we have a first-class view of all that Lakeside has to offer. I’m always happy but never surprised to spot long-lost friends walk by. That reconnecting alone nurtures my body, mind, and spirit to the full. Children see the world so much differently than adults. That can be a positive thing. In my mind, there is no better place to experience that than Lakeside, Ohio. It’s one reason my wife and I return for our annual vacation respite year after year. The inquisitive nature and creative imagination of children were on display the minute we arrived at this Chautauqua on Lake Erie. 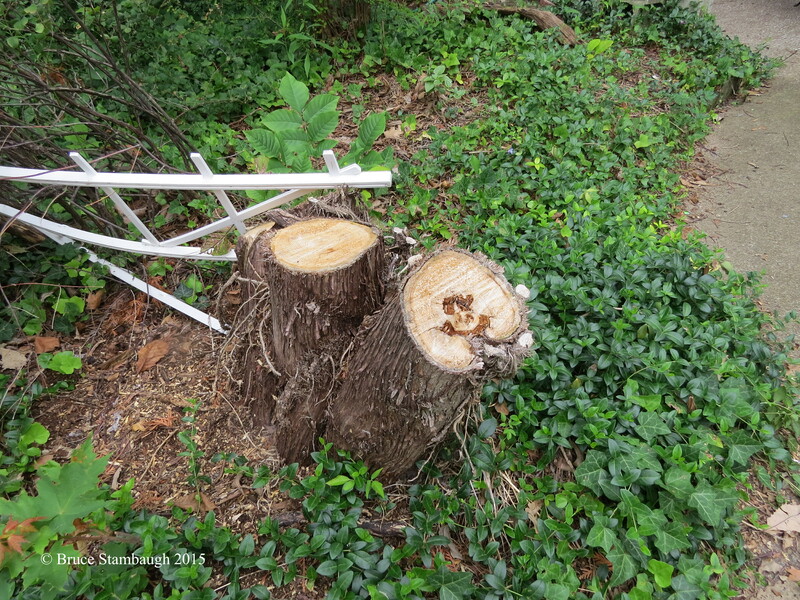 A recent wild rain and windstorm had taken down some trees where we stay. Truncated remnants of one of the smaller trees still looked freshly cut. The child was right. Smack in the middle of the light wood rings darker imperfections perfectly mirrored the ubiquitous smiling icon. Anyone other than a child would have walked right by the gnarly stub without noticing the fascinating find. It took a child. 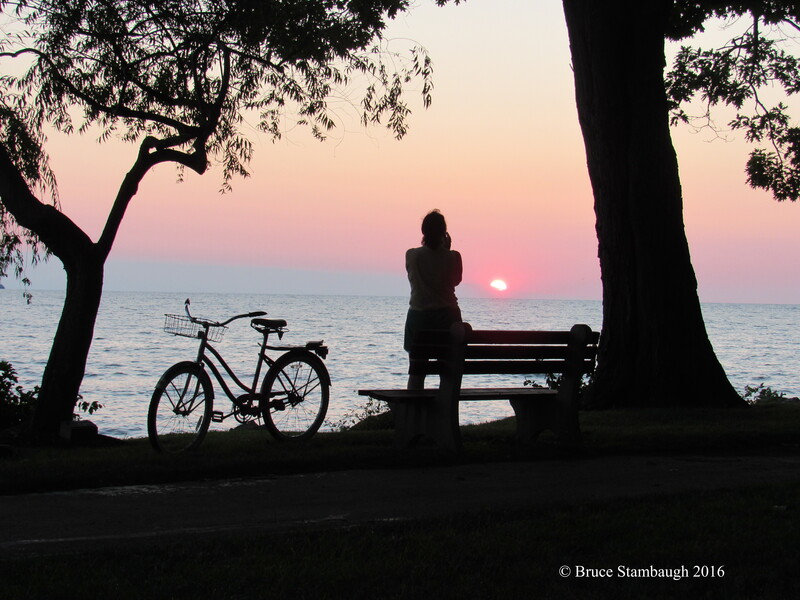 Spontaneous or planned, many inspirational opportunities await all ages at Lakeside. It’s the jewel in the crown that swells the summer resort town to 6,000 from the 300 year-round residents. Inquisitive by nature, youngsters from toddlers to teens tend to view the world from an entirely different perspective than do the older generations of their parents, aunts, uncles, and grandparents. Given all of their learnedness and life experience, adults can too easily dismiss the findings and discoveries of their progeny. At Lakeside, a stiff lake breeze blows away that theory. Imagination and Lakeside are inseparable. During the summer months, Lakeside becomes a gated community. It’s as if when the gates close, minds open. In part, that’s by design. Lakeside’s four pillars of purpose highlight religion, education, recreation, and arts and entertainment. Imagination is the header that secures those fundamental principles together. The Lakeside staff and volunteers go all out to encourage participants of every generation to create, recreate, reflect and uplift. Activities befitting the quartet of categories run from sunrise to beyond sunset. People choose how to engage their imagination. The options are limitless at Lakeside. A young, energetic girl wearing a florescent yellow fairy skirt barked out orders to her small troop of followers as she cycled ahead. Their animated play and laughter took them past quaint cottages. In their world, they may have been exploring the Grand Canyon. The lakeshore drew others to sunbathe, walk, read and dream as sailboats big and small tacked their courses. A roaring cigarette boat occasionally disturbed the peace. 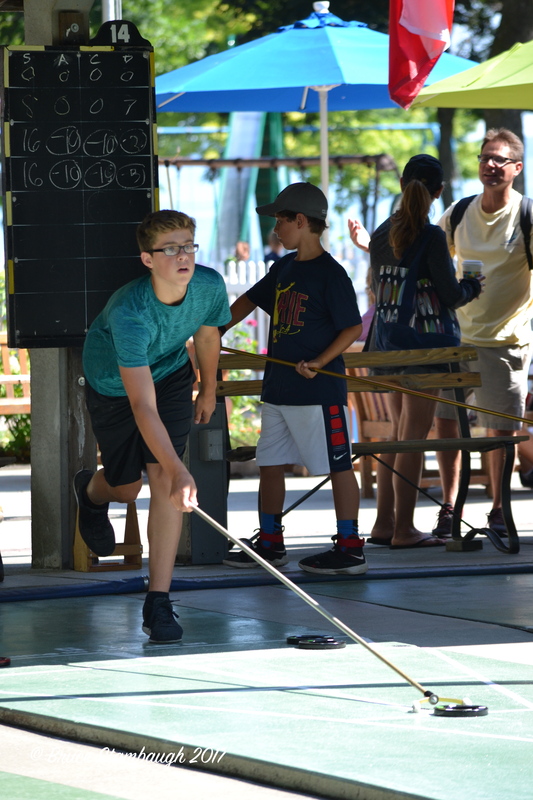 At the shuffleboard courts, still others tested their strategy skills and dreamed of winning the tournament championship. Schools of families camped on the dock plied for whatever nibbled. Fish or no fish, their time together exceeded any catch imaginable. Youth groups sang, studied and tested each other’s faith with blind trust games. It didn’t take much imagination to see that letting go and learning to lead truly went hand-in-hand. Artists applied paint to brush to canvas to the delight of admirers. They dabbed their creativity into familiar scenes with stunning results. Imagine yourself lying in a hammock strung between a pair of giant shade trees as Baltimore Orioles warble and Common Nighthawks dart overhead. That is the reality at Lakeside. Seeing a smiley face in the middle of a stump perfectly sums up the Lakeside life. Imagination thrives there. It’s why we keep going back.